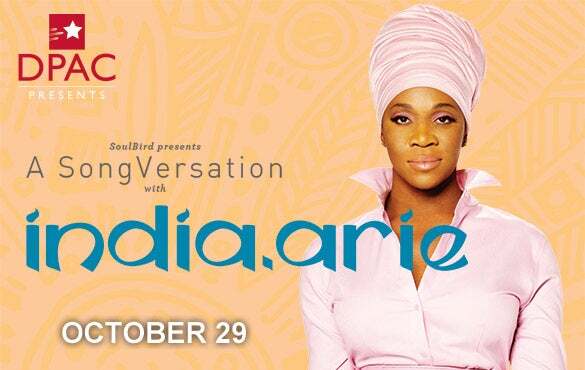 July 15, 2013 (Durham, NC) — Multi-Grammy® winning singer-songwriter India.Arie has announced dates for her highly anticipated Soulbird Presents A SongVersation with India.Arie 2013 North American tour including a stop at DPAC, Durham Performing Arts Center, on October 29, 2013. The tour comes in support of India’s acclaimed fifth studio album SongVersation (Soulbird/ Motown Records) which released June 25th, received rave reviews and marks her fifth #1 on the Billboard R&B Album Chart and fifth top 10 debut on the Billboard Top 200 Chart. Friends of DPAC members may place their orders on July 18. Joining Friends of DPAC is free, and you can register at http://www.dpacnc.com/fod. Special VIP packages will be available for purchase beginning July 16 at Indiaarie.com and Ticketmaster.com. “Since her 2010 sellout at DPAC, fans have been asking us over and over again to have her back. The atmosphere at DPAC is perfect for an artist like India.Arie. With DPAC's great views of the stage and state-of-the-art sound, India.Arie makes you feel almost like you are on stage with her; the entire room comes together in a very intimate concert experience,” said Bob Klaus, GM of DPAC. 2013 continues to be a very busy year for the multi-Grammy® winning, iconic singer-songwriter. In addition to prepping for the US tour, India has made a number of recent national television appearances in support of SongVersation on shows including Good Morning America, The Tonight Show with Jay Leno, BET Awards and a two-episode special on Oprah Winfrey’s Super Soul Sunday. World renowned award winning singer/songwriter India.Arie came onto the national music scene in 2001 with her Motown Records debut ACOUSTIC SOUL. She followed up in 2002 with her sophomore release VOYAGE TO INDIA and then in 2006 released her third album, the more personally expressive TESTIMONY: Vol. 1, LIFE & RELATIONSHIP. TESTIMONY VOL. 2, LOVE AND POLITICS, her fourth studio album, released in 2009. All four releases received critical acclaim and made India a highly respected and noted artist in a very short amount of time. She has sold an impressive 10 million albums worldwide and has received numerous awards and nominations including a staggering 21 Grammy® nominations, 4 Grammy® Awards, 3 NAACP Image awards, as well as awards from BET, Billboard, MTV, VH1, Vogue Fashion, Essence Magazine and others. In between touring and writing music, India also finds the time to help promote causes close to her heart. She is an avid supporter of female empowerment, and is a US Ambassador for UNICEF. She has performed alongside legendary acts such as Stevie Wonder, Sting, Elton John, Adele, Herbie Hancock, Carlos Santana, Bette Midler and Michael McDonald amongst others, written with Stevie Wonder on the title track of his 2005 studio album “A Time For Love,” and has been featured on other various songs including John Mellencamp’s “Peaceful World.” She has performed on such prestigious television specials as The Kennedy Center Honors, The NAACP Awards and The Grammy® Awards and has performed for President Obama, Nelson Mandela, Dalai Lama and at the Nobel Peace Prize ceremony. India recently formed SoulBird, a new lifestyle company with the mission to spread love, healing, peace and joy through the power of words and music. Started simply as an avenue for India to release music, the company has quickly expanded to include other vehicles for India’s messaging including events, merchandise, apparel, music and book publishing, film and TV and other exciting endeavors.